7 Inch 16:9 Wide Screen video monitor with adjustment for Brightness, Contrast, Colour & Tint (NTSC only). Two selectable video inputs. NTSC/PAL Auto switching. The Datavideo TLM monitor series is designed for video professionals that insist on superior performance. After all, every professional knows that you are only as good as the tools you use. 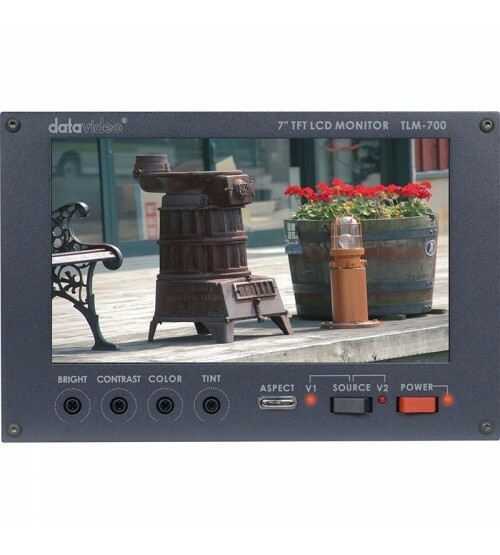 Datavideo work closely with LCD manufacturers to ensure only the highest quality of displays are used, and offer a guarantee against spotlight defect. The high quality professional TLM monitor series automatically switches between PAL / NTSC, and for flexibility can be powered via 12 V DC or AC power.